Jeremy Dittus is doing some amazing work in Denver. Jeremy is the most recent USA Dalcroze "Diplome". That is to say, he is the only person in the past number of years to go to Geneva Switzerland, learn the secret handshake, and come home with the black belt of Dalcroze. He is using all of his well won super powers to make some great things happen in Colorado. I had the pleasure of working with many of his adult students, seeing him teach a group of elementary students (amazing), and sharing some very interesting hours talking about teaching and the future of our discipline. A very worthwhile weekend for sure. Many thanks to Jeremy and Michael for the hospitality, the great eats, and for sharing your students with me. I think your work in Denver is very special and a model for the country. As for my teaching this weekend....I think we were able to get it done. We talked a lot about playing more than just the notes on the page. Where is creativity? Where can you, the artist, be found in your performance? Why would someone spend hours (or lifetimes) in the practice room..... A very very nice group of "professional studies" students. Can't wait to hear about all of the good work in Denver in the future. 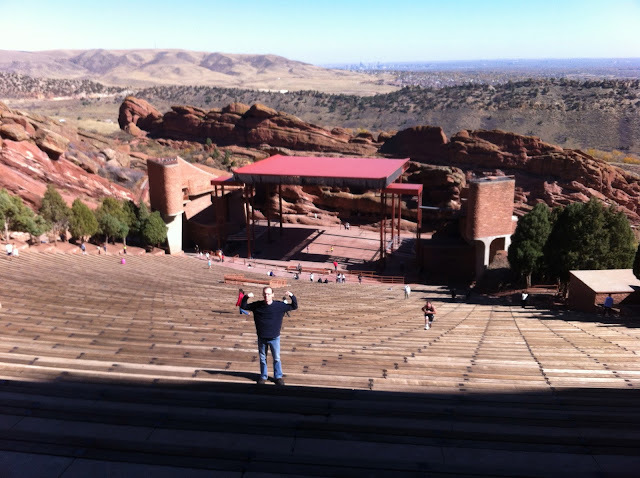 Thanks to James & Emily Pieper for taking me to Red Rocks Ampitheater!